HomeNoble-Delek and EMG – What if they Voted to Not Supply the Gas as Promised? Noble-Delek and EMG – What if they Voted to Not Supply the Gas as Promised? A NOBLE DEAL BETWEEN DELEK GROUP, NOBLE ENERGY, EGYPTIAN EAST GAS, EMG AND THE COMBINED COMPANY EMED? We have not named the Commenter but his comments can be found at the bottom of the article republished in part below. We have found that some of the most important points of any article can be found in the comments and we believe that this is no exception. Moreover, whether inadvertently or otherwise, the commenter used the spelling “voting bloc” which is generally the parlance of a reference to the ultra-Orthodox Jews who tend to vote as a unit, upon the determination of a rabbi, prominent businessman, etc. That too may be no coincidence and in all honesty is speculation. Also noteworthy, the deal allegedly solves other problems, including ongoing litigation regarding the wells, Leviathan, Tamar and Dolphinus. We note that in Hebrew a Leviatan is a whale (or a navigation system). Over the course of the next few weeks, we will dissect the deal piece by piece along with the owners of each of the companies and we will try to provide a timeline. We believe, an opinion based upon an analysis of several years worth of articles and numbers, that the deal may not be completely kosher. For one, it creates a natural gas monopoly, a power keg for price manipulation, supply manipulation and depending upon the flow of gas, power brokering. For another, if the parties decided to build another pipeline, through “Kerem Shalom and the Sinai” they could create a different sort of monopoly, particularly if the second pipeline were owned by the same consortium of owners. Finally, the pipeline has a long and sordid history, one which could repeat itself, particularly if the countries involved, namely Israel and Egypt were to fall into the hands of fundamentalists – whether Jewish, Muslim, or others who could play the religious control card at whim. We leave you to your own conclusions. EMED = Delek Drilling LP, Noble Energy Inc., and Egyptian East Gas Co.
EMG owns the subsea pipeline (between Ashkelon in Israel and El-Arish in Egypt) that will carry the Gas between Egypt and Israel and is owned in large part by Thai Energy Company PTT (PTT.BK), state owned Egyptian company EGPC and Investment group MGPC, and Egyptian East Gas. Yitzchak Tschuva is the “owner of Delek Group” and Delek Drilling LP, which now owns a stake in EMED. Noble Energy Inc.is a Texas based company, with interests to be published in a separate article. Leviathan and Tamar are the Israeli reservoirs, subject to the gas deal. Consummation of the deal with EMG will allow the company to pursue more contracts, Abu said. Among the options is a bigger deal with Royal Dutch Shell Plc, which is considering buying gas from Israeli and Cypriot fields partly owned by Delek and Noble. EMG, owned by Israeli businessman Josef Maiman, Egyptian, US, and Thai investors held sole rights to import Egyptian gas to Israel. The deal was signed in 2005 and gas began to flow in 2009 to supply Israel Electric Corporation (IEC) (TASE: ELEC.B22) at a price 40% higher than originally agreed. 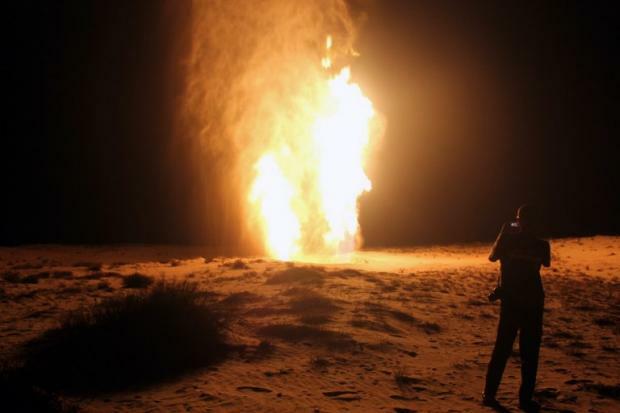 But the gas supply was halted in 2012 after it was repeatedly attacked in the Sinai. The gas deal was terminated and EMG and IEC were awarded $1.8 billion compensation by arbitration proceedings in Switzerland. ““Israel hasn’t given up on the debt and the matter did not come up for discussion during talks on the Leviathan export deal to Egypt that was signed [last] week,” Israel’s Energy Ministry told the paper. A senior Israeli government source, however, told the Israeli business newspaper TheMarker that, while he doesn’t expect Egypt to pay the arbitration settlement, such a move by Egypt will not affect electricity rates in Israel because the Israel Electric Corporation (IEC) has already written off the debt as unrecoverable and incorporated the losses into rates over the last six years. The Egypt-Israel gas deal: What’s the chance it will go up in smoke? The rush is on to complete a $15bn deal to export Israeli gas to Egypt. But with nearly enough gas to supply itself, does Egypt even need it? TEL AVIV, Israel – There is selling ice to the eskimos. And sand to the Arabs. Now there’s gas to Egypt. The rush is on to finalise a deal which would see $15bn worth of Israeli gas supplied to a private Egyptian company during the next decade. The agreement between Israeli company Delek Drilling and Texas-based Noble Energy, who are partners in Israel’s Tamar and Leviathan fields, and the private Egyptian company Dolphinus Holdings was first publicised in February. As yachts passed by in Israel’s Herzilya marina earlier this month, the deal continued to sail through as Delek shareholders voted to invest in a company controlling the only pipeline between Israel and Egypt. One of the Delek shareholders who attended the meeting said a company representative told those gathered that, with control of the pipeline, gas could flow as quickly as the end of the year to Egypt – and so would their returns. “We will see the money in a very short amount of time,” he said they were told. The same parties announced a similar deal back in March 2015, at a time when Egyptian households and factories had been suffering regular blackouts as a result of energy shortages. That deal never came to fruition. Three years later, the market in the gas-rich East Mediterranean – and globally – has transformed, leaving one pesky detail for Israeli gas dealers: Egypt is now nearly gas self-sufficient. But there is every necessity for Israel to sell gas: the longer the gas sits unsold, the more gas will be discovered in the Mediterranean, and the more likely that Israel’s dream of cost-efficient regional sales is postponed indefinitely. But that is not what is said publicly. Israeli government reports have concentrated instead on arguments based on Israeli national security. What’s in it for Egypt? Critically, the gas deal announced in February would allow Delek and Noble, and smaller partners in the field, to continue investing in Israel’s biggest gas field, the aptly named Leviathan, which has yet to produce any gas since it was discovered in 2010. The companies have already invested $3.75bn in the first phase of Leviathan’s development, which they called the largest energy project in Israel’s history. Industry observers expect the field to start producing next year. The logic for Cairo is much less clear: once Egypt can satisfy its domestic needs – which could happen as early as 2019 – then Israeli gas, say analysts, will likely cost more than Egyptian gas simply because of the added costs of importing it. The gas could still potentially be re-exported from two largely idle liquefaction plants in the Egyptian towns of Idku and Damietta, the only such facilities in the Eastern Mediterranean. That’s the vision Egyptian President Abdel Fattah el-Sisi has for the country. When the deal was announced, he said Egypt had “scored a goal”. If this were to happen, then Egypt would profit from tolls and transit fees. But there is also a widespread belief among industry observers that it won’t be long before Egypt discovers even more gas, and will want to use the limited capacity of the LNG plants to export its own. Given that the commercial basis of the current deal is unknown, it is unclear from which Egypt would profit more: exporting its own gas or re-exporting Israeli gas. None of these details, however, has stopped the deal from moving forward. If anything, the clock is ticking as the companies selling Israeli gas attempt to push into one of the last viable local markets. Meanwhile some Egyptians, such as political analyst and former geophysicist Khaled Foad, have been left shaking their heads. The deal may be a private one, Foad said, but politicians continue to refer to the deal as one struck between the Egyptian and Israeli governments. He underlined how Israeli Prime Minister Benjamin Netanyahu has said that the money from the deal will be invested to improve health and education for Israelis. The deal is but the latest chapter in an East Mediterranean saga that has seen Israeli and Egyptian gas fortunes rise and fall, their fates murky and seemingly intertwined. It is also a saga which has, at various points, left both Israelis and Egyptians in the dark. A decade ago, Egypt was a net exporter of gas, providing 40 percent of Israel’s natural gas at some of the lowest prices in the world. The sweetheart deal was made between two state-run Egyptian companies and the Egyptian-based company East Mediterranean Gas (EMG), which formed in 2000 to build a pipeline between Egypt and Israel, and whose partners include former Israeli intelligence agent and energy tycoon Yossi Maiman. It drew criticism from Egyptians and fed into the uprisings which overthrew then-president Hosni Mubarak in 2011. In 2012, two Egyptians considered to be the original deal’s architects – former oil minister Sameh Fahmy and businessman Hussein Salem – were convicted and sentenced to 15 years in prison, but were later acquitted. By 2013, Egypt had suffered years of political instability and energy sector mismanagement, including other questionable deals which MEE has investigated, as well as repeated attacks in the Sinai on the gas pipeline. Egypt was unable to meet its domestic demand and honour its export contracts. Instead it began importing expensive liquid natural gas (LNG) for a rising population which was suffering from regular blackouts. Israeli gas: Who will buy it? Egypt fell into an energy-dependent slump – but the future for Israel, which had long imported its gas, was looking bright. In 2009, Noble and Delek discovered the Tamar field, quickly followed in 2010 by Leviathan, one of the largest global discoveries this century. Then minister of infrastructure, Uzi Landau, said the discovery was “the most important energy news since the founding of the state” and there was talk of Israel becoming the regional gas hub. But in the years that have passed, companies have struggled to untangle a Gordian knot of political and economic problems relating to one issue: how to sell it. In 2015, after energy companies had invested billions to discover the fields and waited years to produce gas, the Israeli government approved regulations to make the sector more competitive, a move that many believe frightened off foreign investors unsure what the government might do next. Almost a decade after it was found, only Tamar has produced gas for commercial consumption. It currently supplies nearly all of Israel’s gas, but its only non-domestic customers are Jordan’s state-owned Arab Potash Company and its affiliate Jordan Bromine. The Tamar deal, and a much larger agreement signed in 2016 which would see gas from Leviathan supplied to Jordan’s state-owned National Electric Power Company (NEPCO), have been met with street protests and criticism from Jordanian parliamentarians. As time has passed, the list of potential customers has shortened. Cyprus has discovered offshore gas. Lebanon has serious prospects of finding its own. The political tensions between Israel and Turkey, which would have made an ideal market for Israeli gas, have so far precluded sales there. There has also been a dream of selling gas through the EastMed, a proposed 1,900km $7bn underwater pipeline running from Israel through Cyprus to Greece and Italy. But cost and major logistic challenges have crushed that idea, leaving Israel with only one possible customer for a quick sale: Egypt. Does Egypt need Israeli gas? Egypt’s need for Israeli gas, however, is questionable. In July 2015, Italian energy company Eni discovered the Zohr “superfield” – the largest gas field ever found in the Mediterranean – then began producing gas last December. Egypt is now expected to have a gas surplus as early as next year. So when the Delek/Noble-Dolphinus deal was announced this February, many were left shaking their heads. Why did Egypt need this gas? Even if it is going to be re-exported, did it make economic sense? 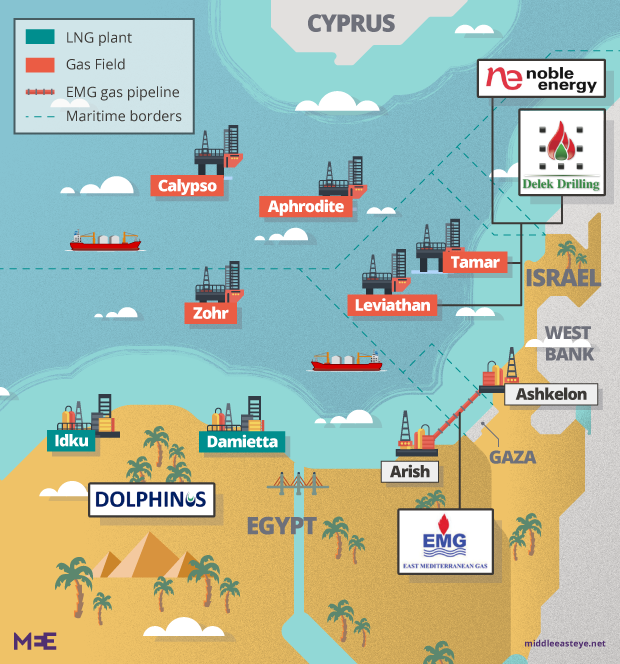 But earlier this month, as Delek shareholders voted overwhelmingly to invest $200m into EMG, the company which carried the cheap Egyptian gas to Israel a decade ago and still controls the pipeline running between Israel and Egypt, the deal continued to move forward. By investing into EMG, Delek and Noble would hold the largest voting bloc in the company, allowing them to pass a motion to reverse the pipeline’s direction. However, hurdles remain. There are still billions of dollars in settlements hanging over the deal after the state-run Egyptian Natural Gas Holding Company (EGAS) terminated its contracts with EMG to export gas to Israel in 2012. In 2015, the International Chamber of Commerce in Geneva ordered EGAS and Egypt’s General Petroleum Corporation (EGPC) to pay a $1.76bn fine to the Israeli Electric Company and $288m to EMG for halting the gas supplies. Egyptian Energy Minister Tarek el-Molla reportedly said earlier this year that the deal hinges on the settlements. Egyptian news site Mada Masr has also reported that the Israeli government had agreed in principle to reduce the amount of the fines owed if the Egyptian government would allow its private sector to import Israeli gas.